Barcelona will meet Athletic Bilbao in the Copa del Rey final after Luis Suarez and Neymar sealed a 6-2 aggregate win over Villarreal. 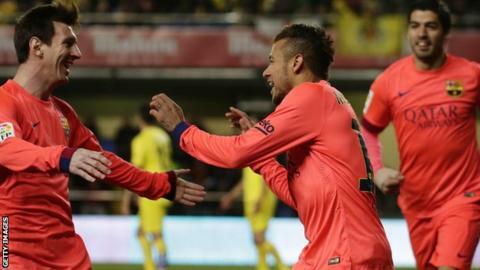 Leading 3-1 from the first leg, Barca struck early through Neymar before Jonathan dos Santos levelled. But after Tomas Pina was sent off for a reckless tackle, Suarez rounded the goalkeeper to put the tie beyond doubt and Neymar added a late header. Bilbao won 2-0 at Espanyol to win their tie 3-1, setting up the 30 May final. The final brings together the two most successful teams in the competition's history as Barca, with 26 wins, have three more than Los Leones. Despite their cup history, Bilbao have not won major silverware since beating Barca in the 1984 final and they will need to be at their very best if they are to stop Luis Enrique's current crop, who have won every leg on their way to the final. It will be a first final in the managerial career of Enrique, who declared his side were in a "perfect moment" of form ahead of their visit to El Madrigal as they chase glory in La Liga, the Champions League and Spain's domestic cup. It took only three minutes for those words to be ratified as Lionel Messi's sublime clipped pass over the home defence tempted goalkeeper Sergio Asenjo from his line and Neymar poked in. Enrique's only concern from the trip to Spain's east coast will be the health of midfielder Sergio Busquets, who was on the end of an ugly tackle by Pina in the build-up to Dos Santos's back-post volley. The Spaniard's ankle rolled under the challenge and he left on a stretcher before play restarted. Tests on Thursday showed the 26-year-old had suffered an ankle sprain that rules him out of Sunday's league match with Rayo Vallecano at the Nou Camp. He is also a doubt for the Champions League last-16 return leg against Manchester City on 18 March. By the time Busquets emerged to sit with the coaching staff on the bench late on, Pina had been dismissed for tackling Neymar from behind and with a man advantage, Barca were comfortable when Suarez raced clear to round Asenjo. Pina's aggression ended what was an intriguing contest and it was left to Neymar to meet a Xavi cross with a straightforward header to complete the scoring. Barcelona beat Bilbao 3-0 in the 2012 final and, with just two defeats in 27 games, will fancy their chances of landing the trophy.